Like most girls – well, like most people – I dream of someday getting married. I don’t see this happening anytime soon, since I am about as single as they come. But that doesn’t stop me from dreaming. I dream about my wedding dress, and the music I will include. I dream of the time of day (or night) when my wedding will take place, and plan who to ask to be my bridesmaids. Now you know me: I will be making something for my wedding. I’m not brave enough to make my wedding dress. I’ve thought of tatting my bouquet so I can save it for forever, but there’s something about real flowers that is impossible to capture in another medium. One thing I have decided, though: I will knit my wedding veil. Would you like to see it? This is Goldenregen, designed by Herbert Niebling. 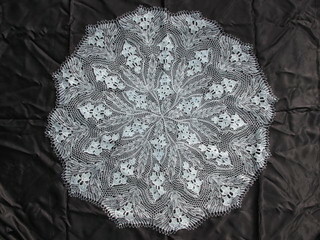 I think it is some of the most beautiful lace I have ever seen. And I want it for myself. It will be beautiful, and I will be beautiful in it. Now I just need to learn how to knit lace….